As you can tell from the banners appearing all over Wikipedia, their fundraiser is in full swing. Despite Wikipedia’s importance as a global resource, only about one in a thousand Wikipedia readers donate. One way to improve that would be better banners, and that’s why my research group is launching the Wikipedia Banner Challenge, a website to collect and prioritize banner ideas for Wikipedia. You can participate by voting on banners and suggesting new ones. It is quick, easy, and even a little fun. The Wikipedia Banner Challenge builds on previous innovative efforts by Wikipedia to involve their community in the design of the fundraiser, especially during the 2010 fundraiser. In a continuation of that community-driven spirit, Wikipedia announced on their blog that they will be watching the results from the Wikipedia Banner Challenge closely and will use some of the most promising banners during the fundraiser. In other words, your banner could appear in front of Wikipedia users around the world. In addition to building on previous efforts by Wikipedia, this project also furthers work by my research group on developing methods that enable communities to collect and prioritize information in a way that is democratic, open, and efficient. So far, our free and open source website, www.allourideas.org, has been used by governments and non-profit organizations around the world. The Wikipedia Banner Challenge provides an interesting test case for our methods, and we are excited to see the results. Wikipedians, if you want better banners for the fundraiser, give us your ideas. Governor Genro tops President Obama on Citizen Feedback: "The Governer Asks" vs. "Open for Questions"
Something neat is happening in Porto Alegre, Brazil today. Governor Tarso Genro, of the state of Rio Grande do Sul, is meeting with some of his constituents. Of course, that’s pretty normal; governors meet with constituents all the time. What is neat is how those constituents were selected. They are not the ones with the most money or influence, they are the ones with the best ideas. These 50 constituents were selected to meet with Governor Genro through a process called Governador Pergunta (The Governor Asks). The process started when citizens suggested 1,300 ideas related to five different aspects of health care (e.g., access to care, family health). Next, the Governor’s office launched a major public outreach campaign to encourage residents to prioritize these ideas through an online voting process. 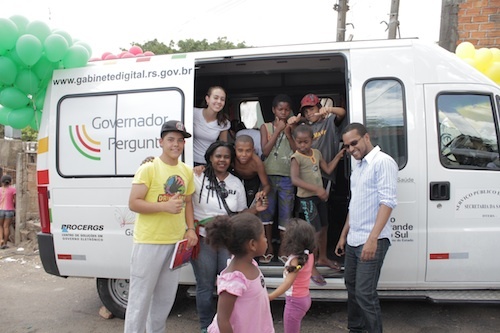 To broaden participation, there were public events and even a “voting van” packed with Internet-connected computers that drove around the state. In just 30 days, Governador Pergunta collected 120,000 votes, and these votes were used to select the top 10 ideas in each of the five categories. To readers in the US, Governador Pergunta might sound like President Obama’s Open for Questions, and the two did have the same admirable goal: to increase public participation in government. But, there were important differences in their implementation that lead me to conclude that Governor Genro’s Governador Pergunta topped President Obama’s Open for Questions. One reason that the voting mechanism in Governador Pergunta is better is that voters made their decisions independently; they had no information about how others had voted. In Open for Questions, in contrast, voters made their decisions interdependently; items were sorted by popularity and this popularity was shown to voters (see screenshot above). This type of interdependent voting system, unfortunately, can lead to strong and unpredictable fads where some ideas get additional support mainly because they had been supported in the past. As I’ve shown in some earlier web-based experiments, the stronger the interdependence of decision-making, the weaker the relationship between underlying quality and ultimate success. In other words, interdependent voting systems are not good for finding the best ideas. Further, the pairwise comparison voting mechanism used by Governador Pergunta is more manipulation resistant. Recall that in the approval voting system used in Open for Questions, the voters chose which items to consider. This feature makes it easy for a small group of people to rush to a single idea and push it to the top. This weakness was quickly discovered and exploited by the National Organization for the Reform of Marjuana Laws (NORML). 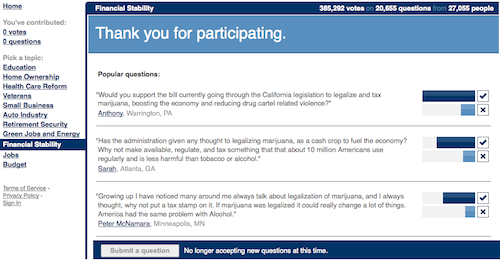 In the midst of a financial crisis and national debate about health reform, many of the highest scoring items in Open for Questions were focused on the legalization of marijuana. With a pairwise comparison voting mechanism, such as the one used by Governador Pergunta, it would have been much harder (but not impossible) for NORML, or any other group, to skew the results because a voter would have had to cast many, many votes before she would get a chance to vote for the idea she wanted to push to the top. Whatever you think about the fairness of marijuana laws in the US, having a system of public participation that is open to manipulation by a small group is clearly not ideal. Finally, in addition to using a superior voting system, Governador Pergunta topped Open for Questions in another way: it was open-source. Just as black-box electronic voting machines threaten public confidence in elections, so to do black-box systems for other forms of public participation in democratic governance. Any effort to make government more open and transparent using processes that are not open and not transparent seems destined to fail. The source code for Governador Pergunta and the source code for the Pairwise API, developed by my research group and used by used Governador Pergunta, are both open-source. The Governor’s team and I hope that other public officials will build on our work to develop even better ways of making government more open, transparent, and effective.